Worst part: The exhaustive story. Broadway and the West End are the dreamscapes of aspiring theatre actors, directors, and playwrights. As theatre’s most prestigious hubs, they light up the night’s sky with billboards and prowess. Productions including Les Miserables, Wicked, and The Lion King have garnered huge profit margins and critical acclaim several times over. Nowadays, the world’s biggest cinema and theatre industries have a helluva lot in common. In fact, said theatre productions drastically overshadow the industry’s smaller players. Joey and Albert Narracott (Jack Monaghan). 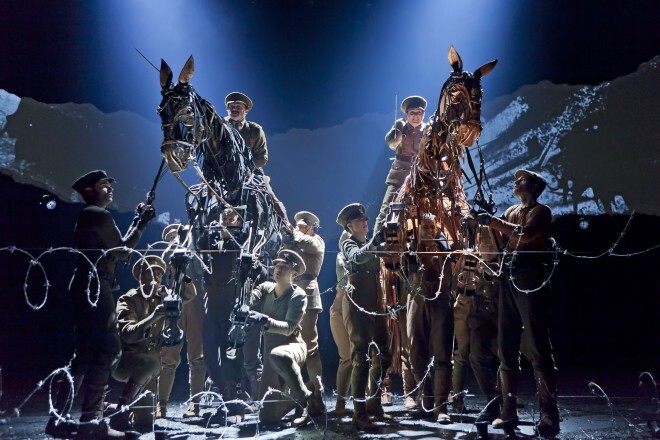 War Horse is a prime example of big-budget theatre’s stranglehold over New York, London, and everywhere in between. Despite its immense power, the play is only one minuscule part of a multi-billion dollar franchise. The play, based on Michael Morpurgo’s 1982 smash hit children’s novel, turns a modest fantasy tale into an exhaustive and overwrought epic. Originally, Morpurgo thought the adaptation was a bad idea. Now, as the royalty cheques flood in, he’s keeping his mouth shut. See, even the world’s most prestigious entertainment hubs are wrought with opportunistic business dealings. No one is innocent! Today, though Steven Spielberg’s misjudged 2011 cinematic adaptation flew in one ear and out the other, the play still works. Just remember, as you walk up the New London theatre’s winding staircases, this adaptation was never considered original or revelatory. The narrative, sticking close to the original story, covers multiple time periods and character arcs. Under the guise of our equine hero, the story depicts war, love, chaos, and heartache. Bought at a Devon auction by alcoholic farmer Ted Narracott (Andy Williams) for 39 guineas (a baffling amount for a poor man in the early 20th century), the horse becomes his son Albert(Jack Monaghan)’s best friend. Named “Joey” by the young farm-hand, the horse is heavily scrutinised by Albert’s mother Rose (Nicola Stephenson) and Ted’s wealthy brother Arthur (Nigel Betts). Trained to plow, the horse becomes the family farm’s lifeblood. One of many war scenes. 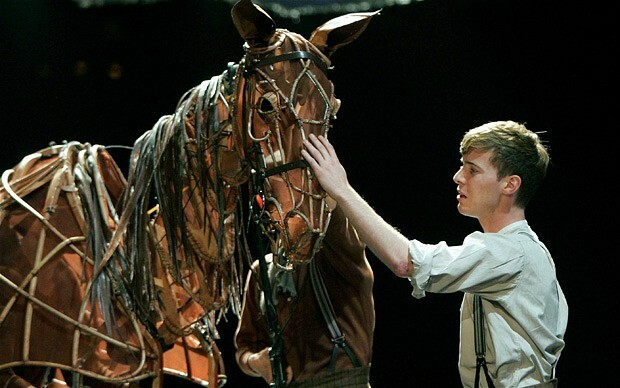 Premiering at the National Theatre in 2007, War Horse is a long-lasting theatre staple. Drawing mass audiences to London’s busiest district, the premise resonates with multiple demographics and tastes. Fit for action junkies, youngsters, criers, and frustrated parents, this production crafts the perfect recipe for appeal. It’s fit for every king, queen, soldier, and stable boy across London. Defined by immense storytelling and technical precision, the production is worth every penny. 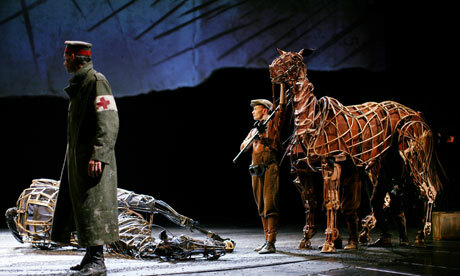 Despite the positives, War Horse gallops into many deathtraps before reaching its heartbreaking finale. The flaws, carried over Morpurgo’s original material, nearly trample this page-to-stage experiment. Playwright Nick Stafford crafts a similarly indulgent and treacle adaptation. Despite dodging Joey’s point of view, the non-human characters cause several unfortunate foibles. Being one of modern literature’s most nondescript and manipulative characters, our lead only carries so much, ahem, horsepower. Stretching to fit the monstrous 160-minute run-time, the narrative darts into several meaningless and hokey directions. After winning over the farmland and town, Joey is sold to Captain Nicholls (Nicholas Bishop). What follows is an egregious war-drama depicting slaughter, prisoners of war, sacrifice, and raw courage. Switching from comfortably comedic and viscerally bleak, the topsy-turvy story is untamable. In the transition from humble page-turner to sweeping epic, the story’s emotional impact and thematic weight becomes wholly diluted. “We’ll be alright Joey. We’re the lucky ones, you and me. Lucky since the day I met you.” (Albert Narracott (Jack Monaghan), War Horse). Forcing us to care about its sorrowful characters and dour narrative, War Horse is blindingly manipulative. The second half, following Albert into World War I after Joey, delivers several fine twists and turns. However, the human characters – given little development – serve only to admire our equine warrior. Despite the weepy moments, the story never solidifies Albert’s affection for Joey. However, despite the story and character foibles, the production itself elevates the material. Galloping between set pieces, story-lines, and characters, the show saddles up the beast, brushes it clean, and shows it off to the adoring public. An example of style and spectacle over substance, it works in fits and starts. In fact, certain set pieces deliver many thrills and chills. Delving into magical realism, the production crafts a balance between sprawling wild fantasy and gritty conflict. Aiming for David Lean’s signature story tropes and visuals, the production survives on technical achievements and wholehearted direction. One scene, examining the story’s true potential, delves straight into the war. After Joey is trapped in barbed wire, a British and German officer work together to free him from a bloody demise. In this scene, the equine and human characters exude enough empathy to captivate a modern audience. Most importantly, the Handspring Puppet Company deliver unparalleled compositions. Handled by three puppeteers (listed as the head, heart, and hind), the horse puppet is a meticulous creation. Constructed of an intricate wire frame, the horse characters are much more fascinating than their human counterparts. 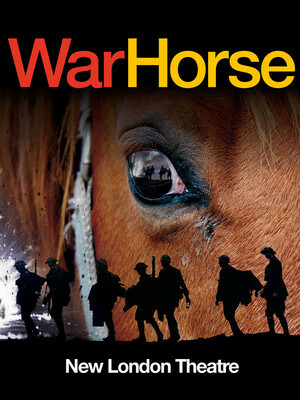 Reaching for its own stellar reputation, War Horse crafts seminal moments and value-for-money entertainment. Thanks to stellar direction, puppetry, and performances, this soulful drama reaches a wide audience. Predictably, this is one of the West End’s most awe-inspiring productions. However, carrying major story and character flaws, the production never capitalizes on its premise. For all the crashes and bangs, the play is as manipulative as the titular creature. Verdict: A flawed but sumptuous production.